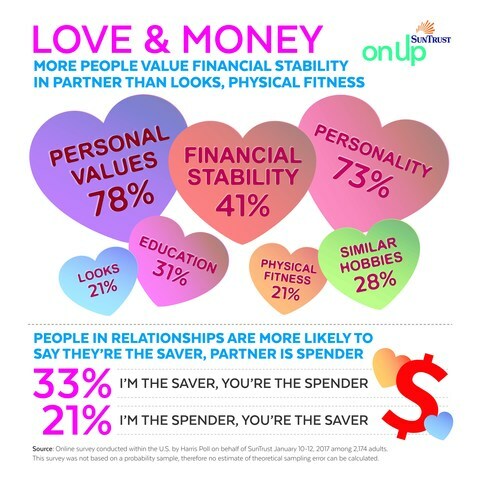 As we approach Valentine's Day, SunTrust found that 41 percent of Americans consider financial stability to be among the traits they find most important in a partner, ranking only behind personal values (78 percent) and personality (73 percent). Further, more people value financial stability than looks (21 percent) or physical fitness (21 percent), according to an online survey conducted in January 2017 by Harris Poll on behalf of SunTrust among over 2,000 U.S. adults. ATLANTA, Jan. 30, 2017 /PRNewswire/ -- As we approach Valentine's Day, SunTrust Banks, Inc. (NYSE: STI) found that 41 percent of Americans consider financial stability to be among the traits they find most important in a partner, ranking only behind personal values (78 percent) and personality (73 percent). Further, more people value financial stability than looks (21 percent) or physical fitness (21 percent), according to an online survey conducted in January 2017 by Harris Poll on behalf of SunTrust among over 2,000 U.S. adults. "People identify financial stability as an important trait because they know money – and how one manages it – impacts a relationship," said Brian Ford, financial well-being executive at SunTrust Bank. "People often enter relationships with different monetary goals and views. For example, one may want to save more for retirement and can't understand why a partner is more focused on short-term experiences. The keys to overcoming financial discord in a relationship are communication and compromise." The SunTrust survey also found that a third of Americans in a relationship believe they are the saver and their spouse/partner is the spender. In contrast, only 21 percent claimed they are the spender and their spouse/partner is the saver. SunTrust is leading the onUp movement to help people achieve financial confidence. Couples can go to onup.com to take a Mental Wealth Quiz, which assesses a person's financial mindset and offers actionable tips. In addition, SunTrust suggests asking your partner the following questions to better understand his or her views when it comes to managing money. What are your most important goals? Talk to your significant other about aspirations and make a list of what you have in common. If aligning your goals is difficult, create a blend that represents your collective core values. How does your past influence your spending and savings habits? Make an effort to understand your partner's personal history. Financial habits are often handed down by parents, so it's important to empathize with your partner and understand how he or she was raised. Would you share your plans before making a big-ticket purchase? It's important to know whether your partner wants to maintain a level of financial independence. Decide whether you need to talk with each other before making purchases above a certain price point, or whether you agree to keep finances separate. What is your debt philosophy? Financial disagreements often arise from different views of debt, from how much to use a credit card to the term and amount of a new car loan. Ask your partner what he or she considers an acceptable level of debt and see how much it diverges from your answer. The survey was conducted online within the United States by Harris Poll on behalf of SunTrust from January 10-12, 2017, among 2,174 U.S. adults ages 18 and older. This online survey is not based on a probability sample and therefore no estimate of theoretical sampling error can be calculated. SunTrust Banks, Inc. is a purpose-driven company dedicated to Lighting the Way to Financial Well-Being for the people, businesses, and communities it serves. Headquartered in Atlanta, the Company has three business segments: Consumer Banking and Private Wealth Management, Wholesale Banking, and Mortgage Banking. Its flagship subsidiary, SunTrust Bank, operates an extensive branch and ATM network throughout the high-growth Southeast and Mid-Atlantic states, along with 24-hour digital access. Certain business lines serve consumer, commercial, corporate, and institutional clients nationally. As of December 31, 2016, SunTrust had total assets of $205 billion and total deposits of $160 billion. The Company provides deposit, credit, trust, investment, mortgage, asset management, securities brokerage, and capital market services. SunTrust leads onUp, a national movement inspiring Americans to build financial confidence. Join the movement at onUp.com.